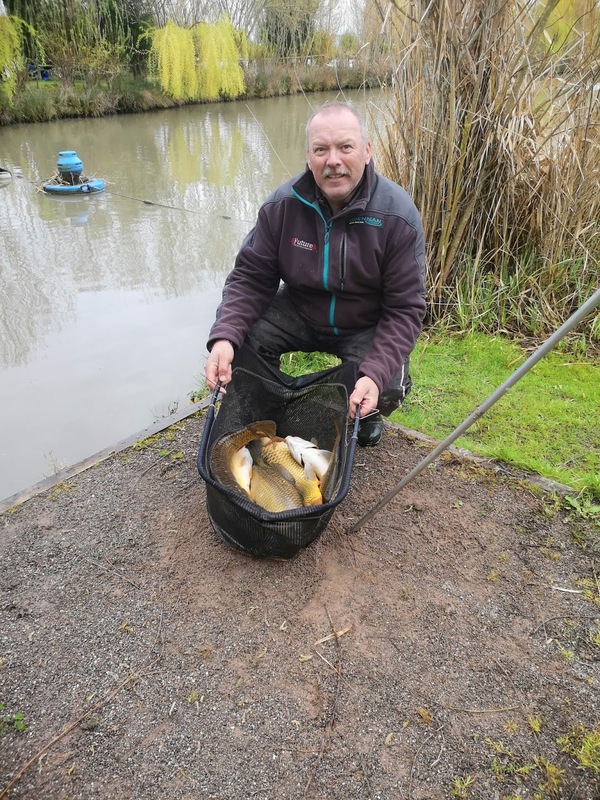 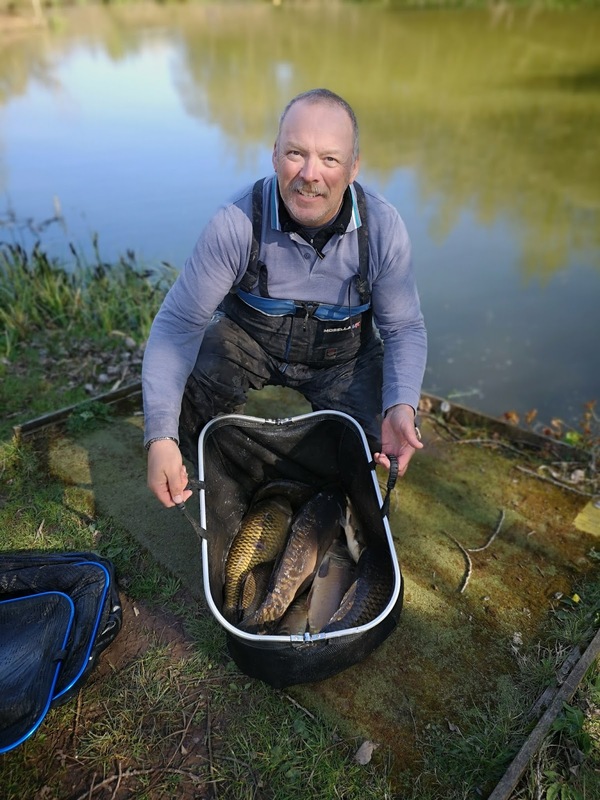 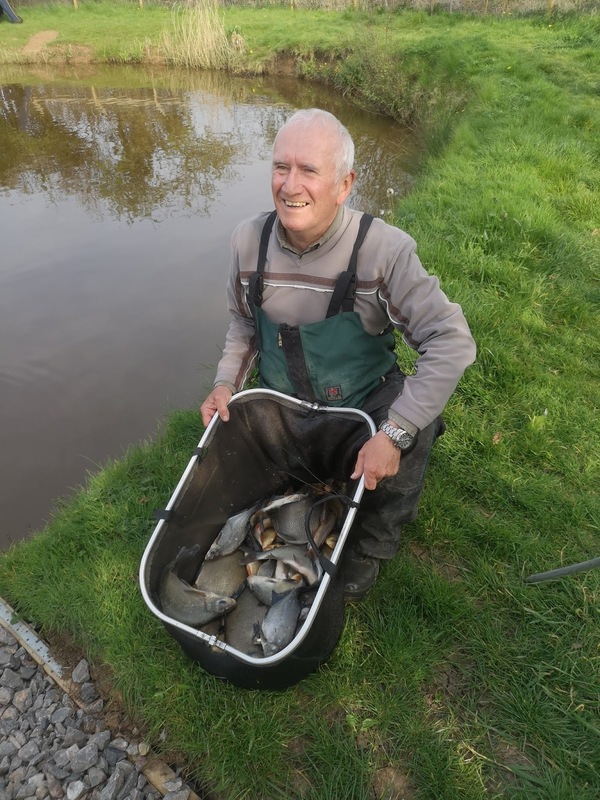 Just for a change Mike nicholls arranged for us to have a knockup at this little fishery run by Mark taylor, there are only 12 usable swims so I soon had ten names, I stopped off in Mario's cafe in stockwood with jason, and it was fair 4.10. The traffic wasn't to bad so we got to the lake with plenty of time to spare, it's probably been at least 12 years since I fished here last, and it had changed, Mark has done loads of work on it, and it's really beginning to take shape. 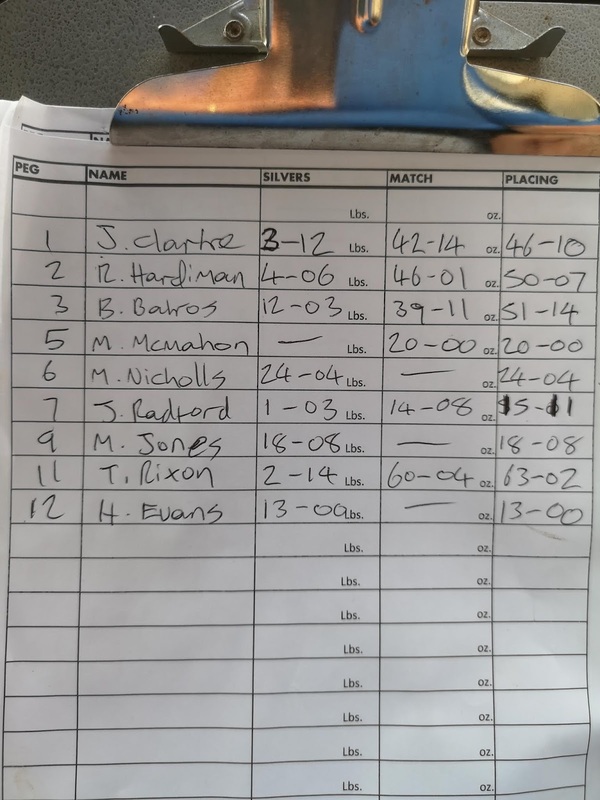 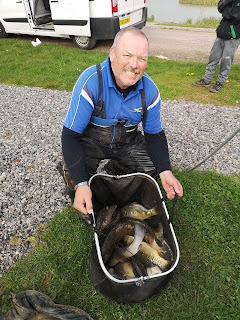 Had a no show so we were down to 9, martin(shaun) McMahon sorted the pegs out, then with everyone there I did the draw at 9, not so much as a draw more.like a pickup as I threw them on the floor. 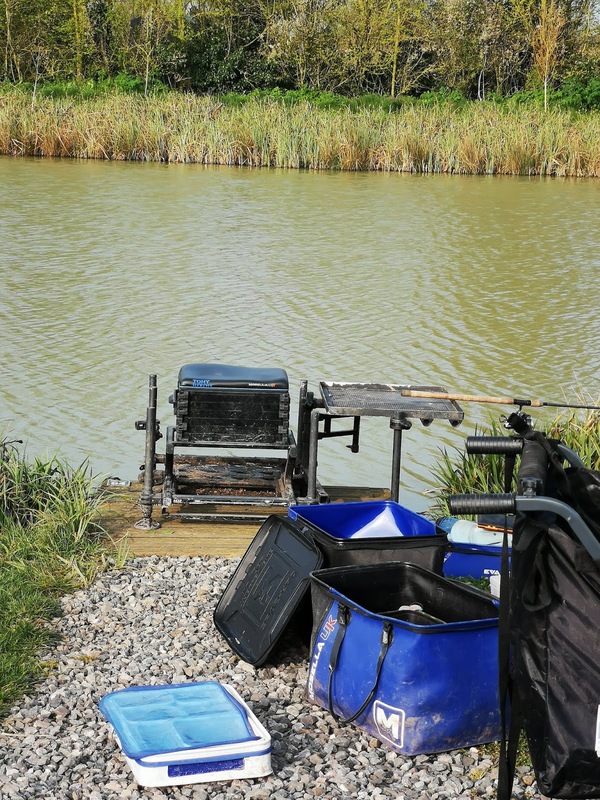 I picked up with three left and had peg 11 , second peg down on the left hand bank, means nothing to me but venue regulars.reckoned it was a good peg, then again they were saying that about every peg. 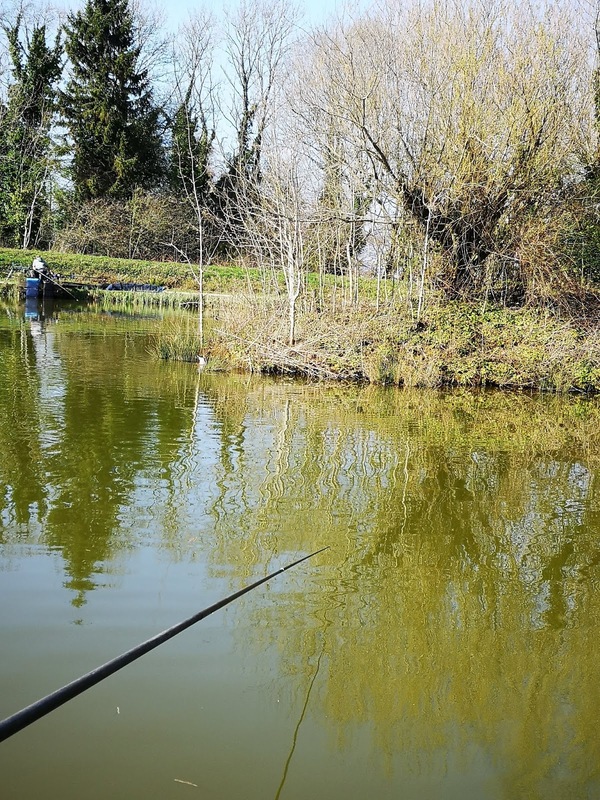 But it looked ok as I had two islands to go at, only down side was that I had to look at bela bakos and Ron hardiman all day. 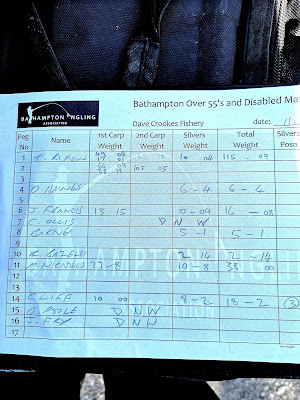 I was told maggot in the deep water and pellet would probably work over to the islands, but the regulars were fishing corn , and also putting some groundbait in As there were some sensible skimmers.to be had, either side of me I had the the bathampton dad's army crew in the shape of Hubert Evans to my right and Mike Jones to my left, both of which would probably fishing for silvers. 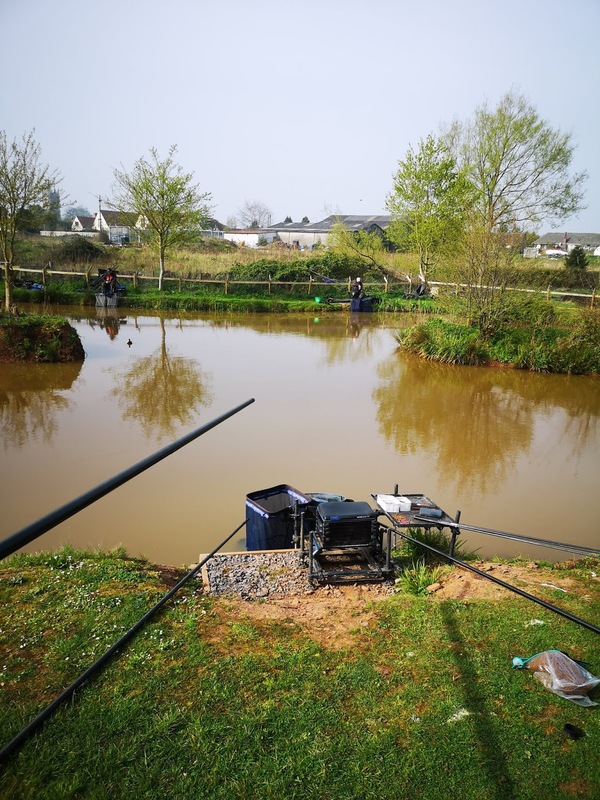 I set up three pellet rigs for towards the island's, one shallow for on the mud line, another for just off in 20 inches of water.and another in about 30 inches, the only other rig was a maggot rig for 5 mtrs feeding soaked micros and maggot. Photo bombed by Rickymills, one day be may even learn how to count past one. 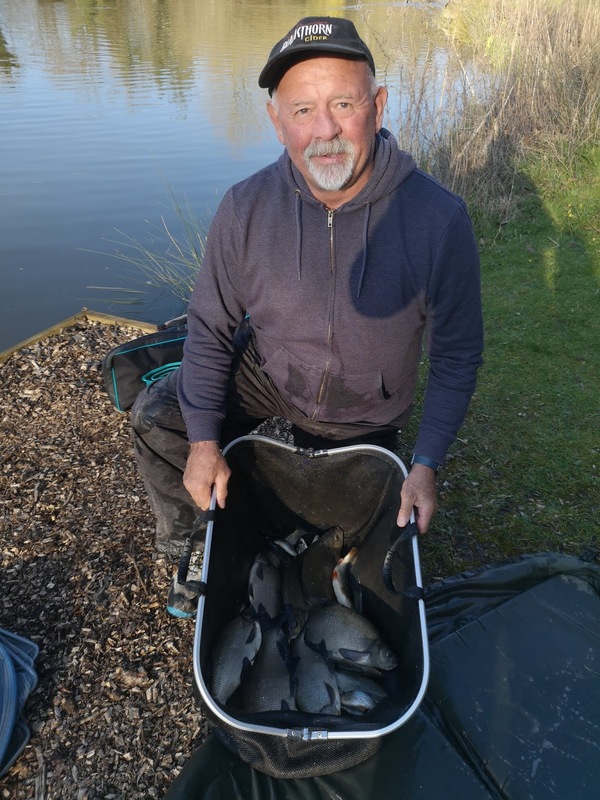 Top silver.weight on the day went to Mike nicholls on peg 6 with 24lb, all small.crucians, tiny carp and a couple of skimmers. 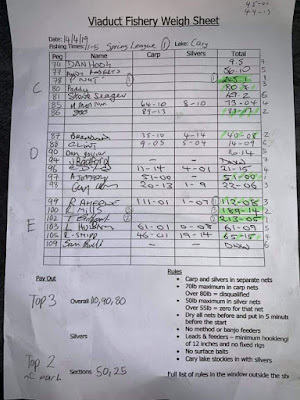 Weigh sheets below as normal. Back to viaduct for this hotly contested and popular series, but not after a stop off in cannards with Jason for breakfast, which I must say has been really good the last few times I have stopped. 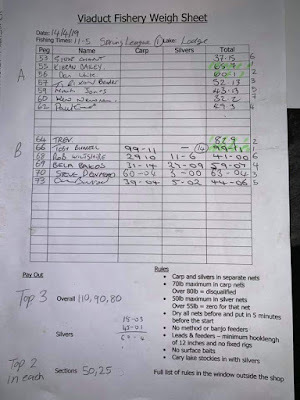 4.6. 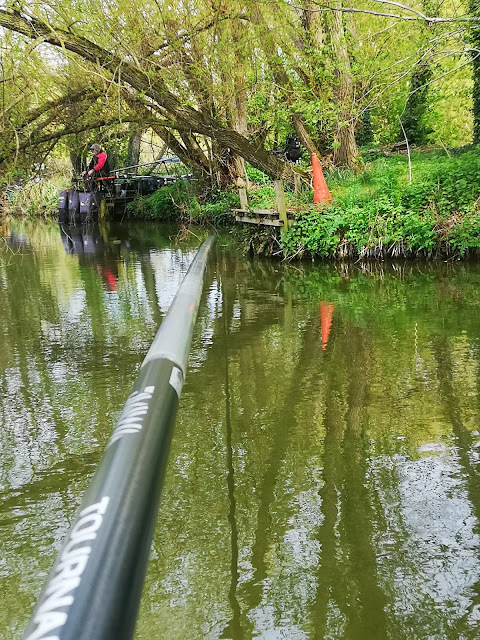 I set a wag for pellet at depth towards the aerator, a couple of pellet rigs for out in front at 16 mtrs and slightly to the right under an overhanging branch, that one would do for 5 mtrs as it was the same.depth, and a small float for pellet over by empty peg 58, which can be good for a few especially towards the end of the match, to my left I had Tom mangnal lookalike and reserve for the day in the shape of Dan white, and around the corner on my right was Mark Jones from across the water in the valleys. 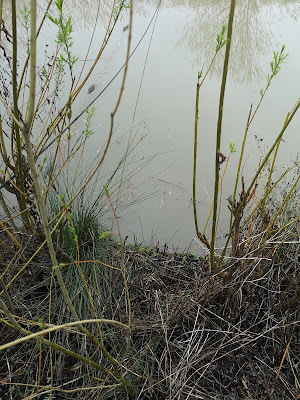 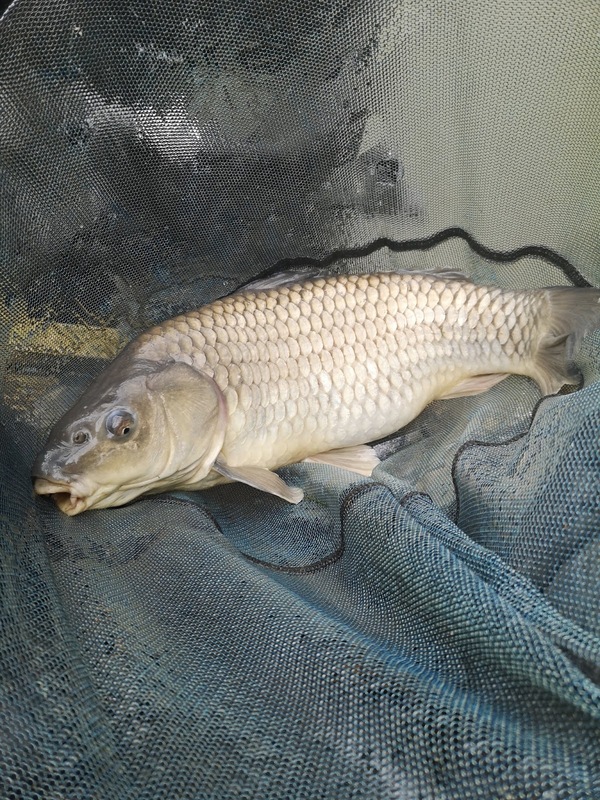 I began straight out at 16 mtrs on banded pellet , whereas most around me began on the short line, I had to wait a while for my.first bite which resulted in a 8oz skimmer, then nothing, so I dropped back into the short line, it was only a short wait until I was attached to a decent carp, it was well under control, when the line went slack and it was gone, I thought it had just come off, but the line had been broken well above the hooklength, so I can only assume it had gone around and underwater snag, probably a branch, so a new rig was out on and I dropped it in, not expecting to get a bite, it I did, and I play this one a bit more forcibly, and soon a nice 10lb common was safely netted. 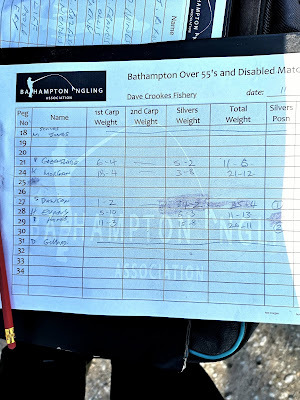 That was my.only.fish from there , in fact it was a really hard match for most on this lake, only.the top corner pegs 64 and 66 seemed.to catching (and losing), as my.match went along , I had one on the wag, losing three , two seemed to be fouled I couldn't tell about the other as it tied me around something hanging from the aerator rope out in front, I did get one carp out in front and another to the right by the branch in the water, and as I half expected two more from in front of pallet 58, and I had one come off at the net from there aswell. 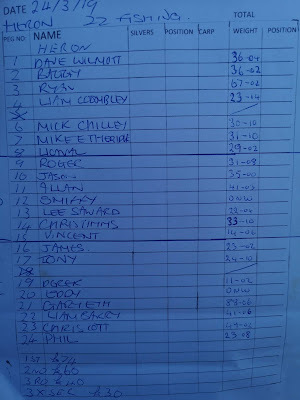 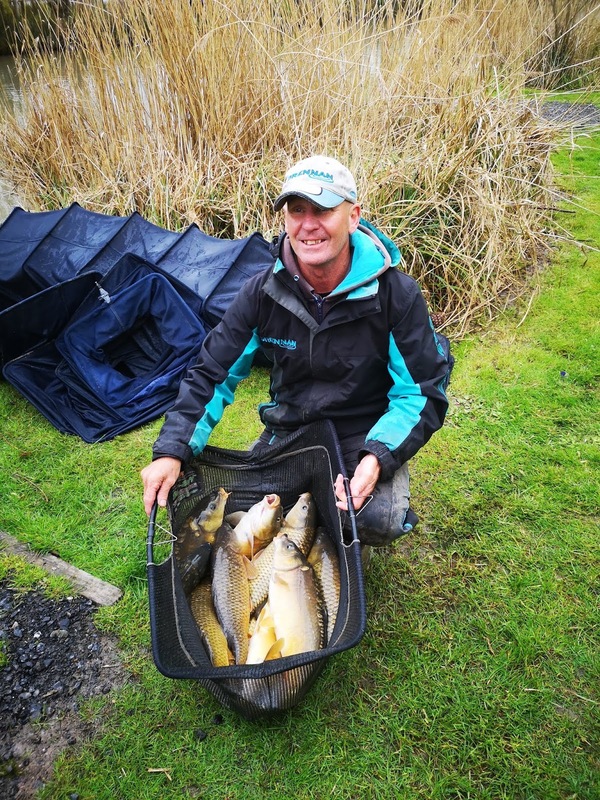 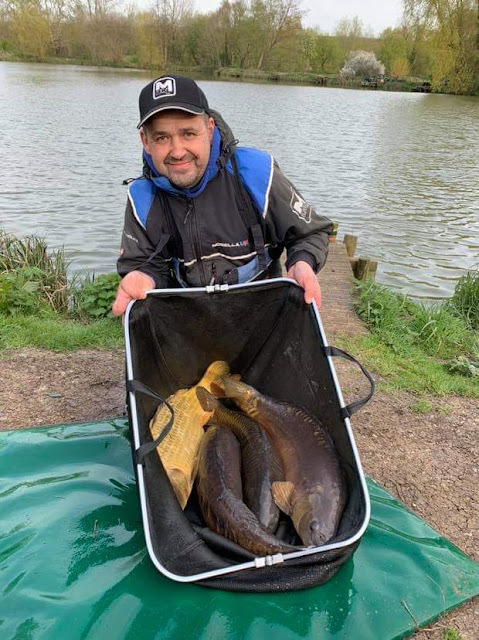 Top weight on the day with 245lb was part time angler Lee pesticcio (p.nut) on peg 78, casting his lead.around the peg, which suites his style, (or lack) of casting prowess lol, good to see , well.done lee. Back for my fortnightly visit to huntstrete, bacon and egg sarnie from my local cafe and a 15 minute drive to the fishery, can't be bad. 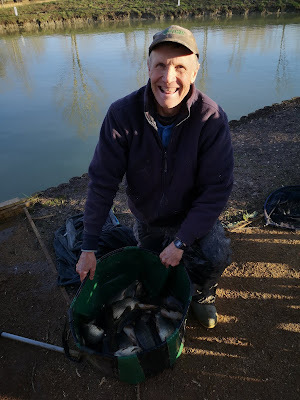 Only 17 or 18 fishing today, so plenty of room, Mr Gillard allowed me to sort the pegs out today, so I put peg 1 in today, much to the dismay of several anglers. 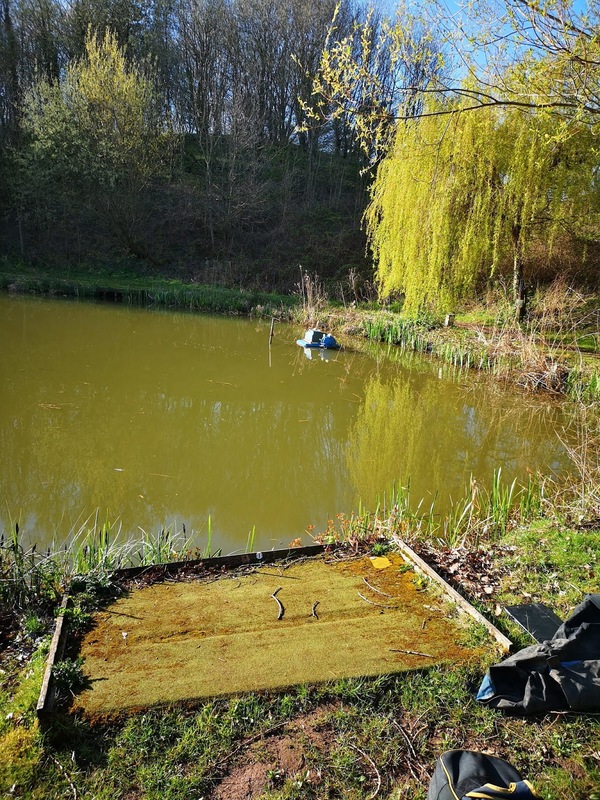 and guess who drew it, he ha me, a few said it served me right for putting it in, but I fancied it as it was at the end of the lake with plenty of room, and it was a short walk from the van. 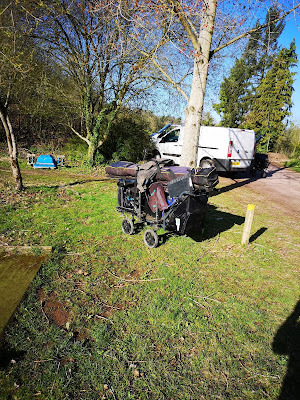 As I said it's an end peg with an aerater at 14 mtrs secured in place with a scaffold tube , which could prove to be a bit torrid if I wasn't quick enough. 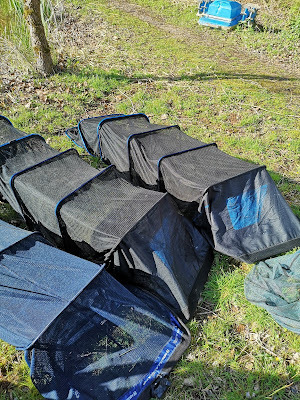 First job put the nets out to dry, and I must say I've had the nets for over two years now, and had no issues, no holes and no broken rings, 2.5mtr mosella space savers, best out there I reckon, certainly standing the test of time for me. 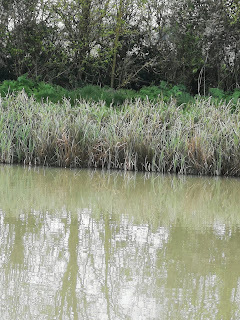 and Cupped some pellets along the margin aswell, went out on the soft pellet and had as one small fish and one skimmer of about a pound, but I could see some clouding down the edge and I couldn't resist it, first put in a 4lb mirror, good start, next drop and I'm attached to an angry ten pound common, which very nearly got under the aerator, then nothing so back out on the soft pellet for a couple of better skimmers and a small tench, then after resting the margin it was back in for a couple of f1,s, there were a few fish cruising about but I couldnt tempt one, so it was a case of catching odd skimmers then going down the edge for an f1 or small carp, then about halfway through something changed as I mugged a good fish, then the last half of the match went well with going from the fish showing no interest to them having a go as long as I could get a pellet on there nose, and they were good fish , no f1,s or small stockies, looking down the lake and listening to the comments , it was proving a hard day, with few.fish being caught, Mike nicholls on peg 11 was doing ok, I could see he was getting nearly all f1,s, by the end I new I had over 100lb, and was confident it was going to be more than enough to win today, in fact I had 115lb, with Mike coming second with 38lb, and steve.Dawson was third with 34lb , mainly.skimmers, but it was hard.for.most. 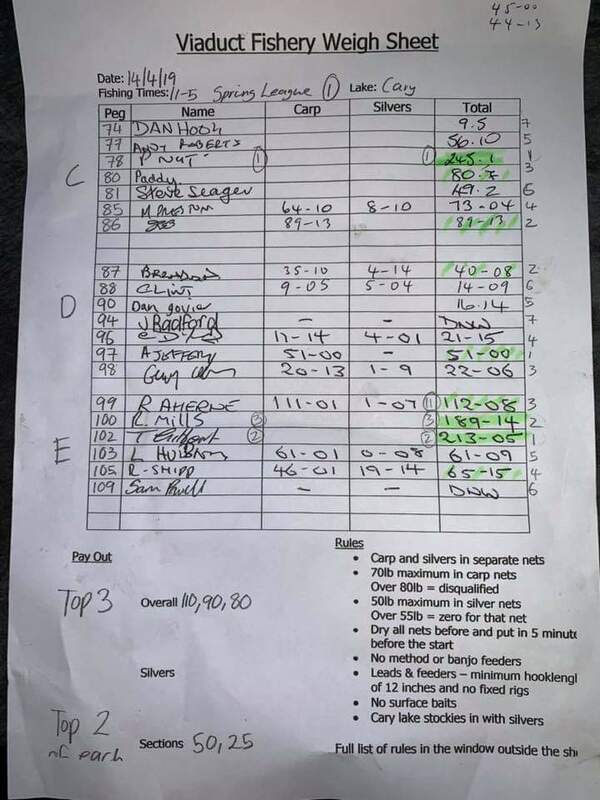 I stopped with Jason at cannards well for breakfast, and it was ok , only a 4.25 as they had changed the sausages for some cheapy,s, but the rest was really nice. 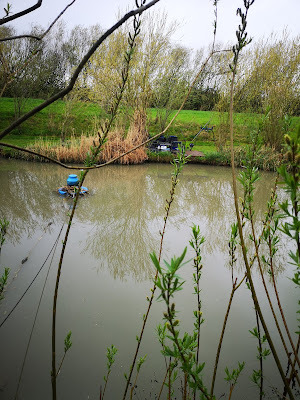 Got to the fishery in plenty of time, and it was good.to catch up on some old friends I havnt seen for a while who were fishing on hillview. With us all there I got the draw sorted, I think Ricky mills pulled mine out and handed.me.64, the far end has been the place to draw of late, although what I've seen of it , the fish are all through meaning it's relatively fair. 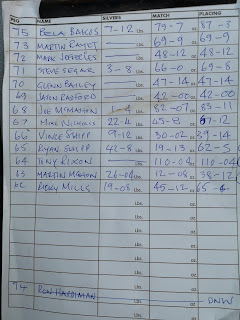 I had Ryan shipp to my right on 65 and Martin McMahon on 63. All the pegs look the same , except some are a bit closer to the far bank. 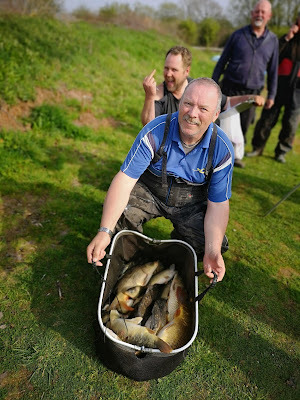 I've been using the mosella Eva trolley bags for ages now and I've got to say I have had no issues at all, and the latest 70 ltr version is really good as it's got a hard top which doubles as an extra bait table if required, and the white bait box system helps to keep your bait dry on those wet days, and it's not expensive. Three pole rigs today , a pellet rig for on the deck at 15 mtrs, a meat rig for 5 mtrs, and a margin rig just in case some fish decided to come in there, the other set up was a waggler for to fish pellet to the far bank which is feed fringed and always good for some fish. Not to much to report on the short meat line and the margins, in fact I never had a bite on either, but in all fairness I only tried the meat line once briefly, and the margin rig didn't even got wet , the long pole line was slow, at the start I had a small carp and an even smaller tench, then I couldn't get a bite on it, so most of the match was spent thrashing the wag along the far bank, feed in 6,s and fishing a banded 8, plenty of indications but the breeze was pushing the float along the far side, not ideal to be honest, although with most of the carp being on the small side, they always seem a bit keener to chase a pellet, Ryan and Martin where catching silvers each side of me , with Ryan doing the best, by the end I new I had 100lb, but I new bela bakos up on end peg 75 had caught also now McMahon on peg 68 also seemed to have done ok, but luckily for me , not quite well enough as bela came second with 87.3 and Joe had 83.11, my.fish went 110.4, it made.a.pleasant change.to waving 16 mtrs about, I may have caught more on the lead, but it was a float only match luckily. 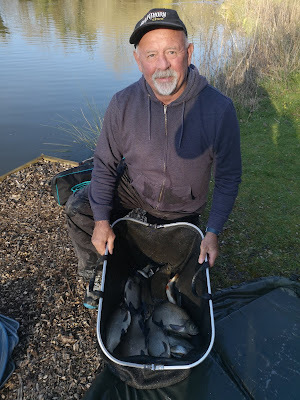 Top silvers.went to Ryan shipp to my right on peg 65 with a lovely net of mainly skimmers for just over 42lb, with Martin McMahon to my left coming second with 26lb , which again was mainly skimmers. 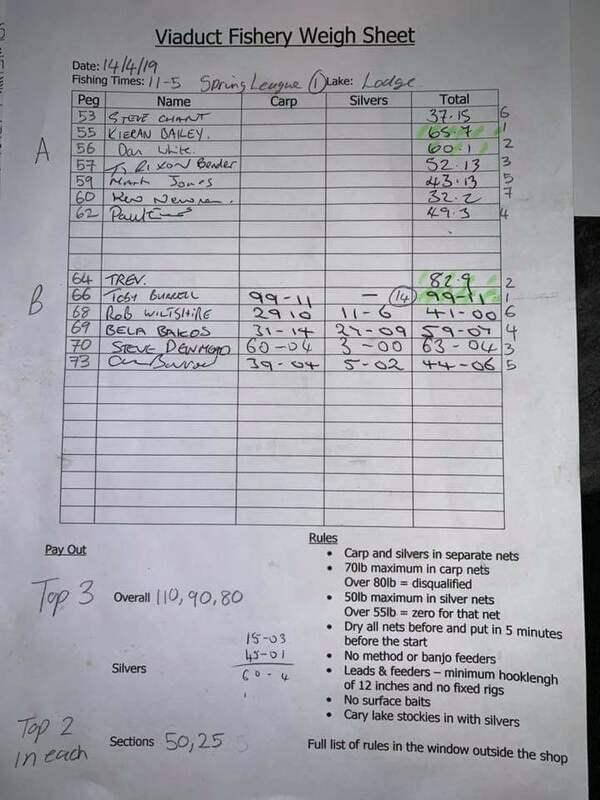 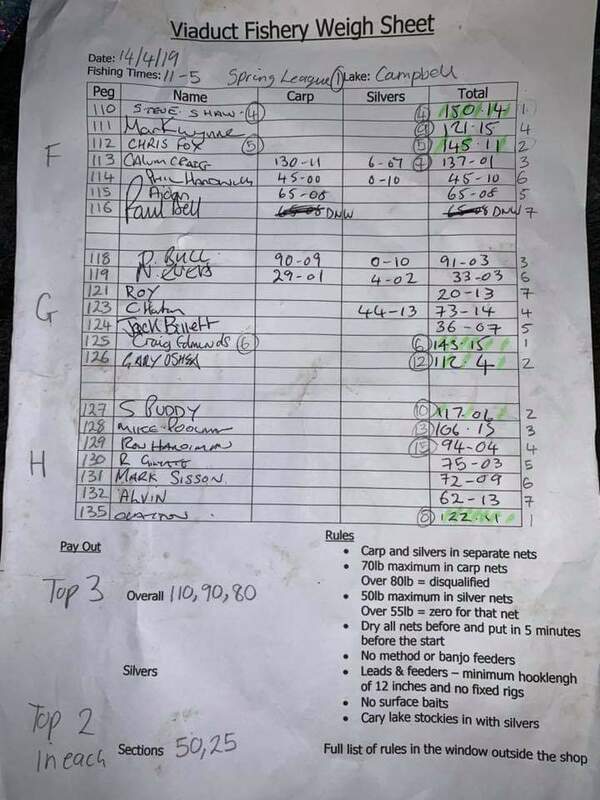 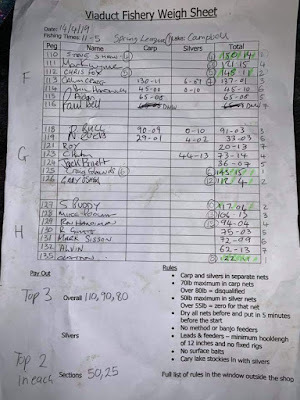 As is normal at this venue, most people will have enough bites to make the day enjoyable, so well done to John candy and his staff for achieving this, weigh sheet below as normal. 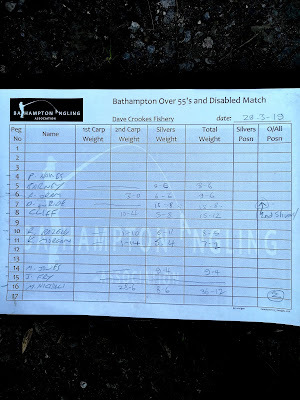 Although we all caught the lake fished quite hard, and as a whole the venue was tough today, there was a silvers match on hillview , and I think only 20 something pounds won that, this week coming it's back to huntstrete on Thursday, then next week it's down to viaduct for the first round of the spring series, but it's meant to get a bit cooler as the week goes on, hopefully it won't affect sport to much. 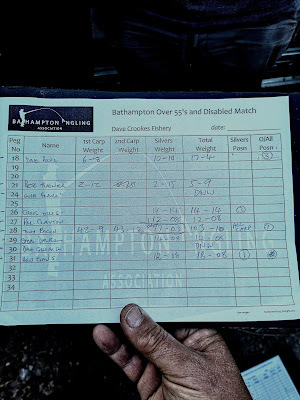 Couldn't get into the match on the main today so I organised a knockup on the West pool, ended up with ten fishing, so not to bad, breakfast on the way in lillypool, and I got to say it was very nice, 4.6 on the rixster scale. 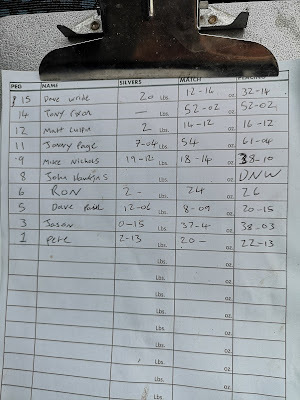 Got to the fishery and got out draw sorted before the other match,mat culpin drew for me and handed me 14 , second longest walk in the fishery, the longest walk was taken by Dave wride (15), I drew for mat and handed him 12, so we were next I each other as 12 wasn't in today, the other side of mat was John page on 11, so I was next to Weston super mares most deadly duo,😂😂😂. 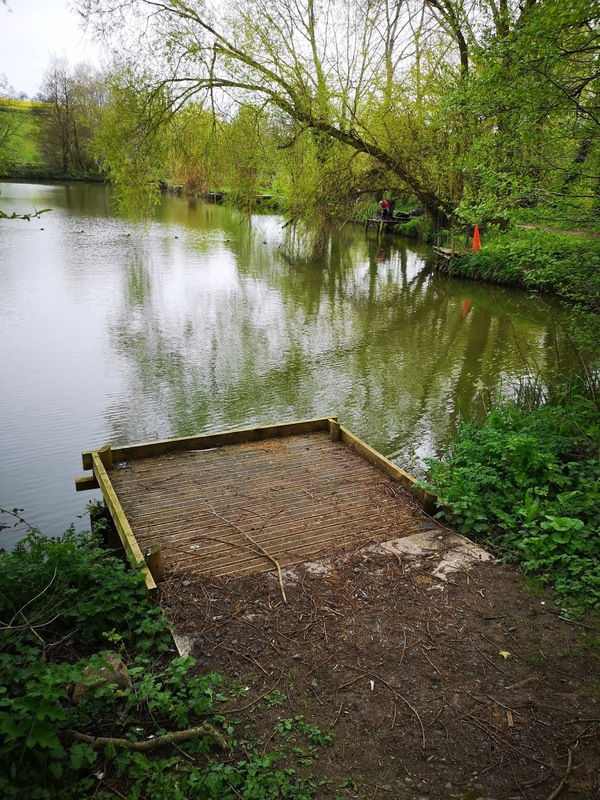 First job was to go around to the far side and clear a couple of spots to fish against. 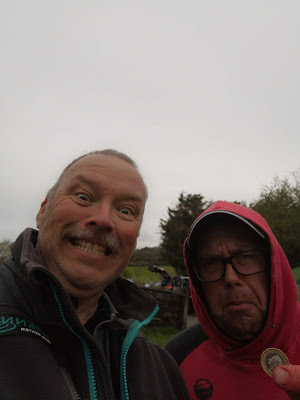 I should have bought my shears round cos that spiky grass is a bit rough to be pulling at. 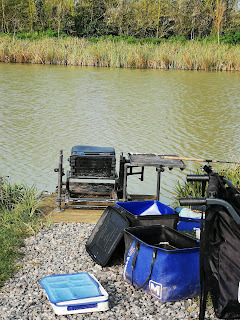 I set up a pellet rig for the far side, a shallow pellet rig for half depth against the far side of possibly mugging , as there were a few fish on the top , even though it was bitterly cold, then a rig for pellet just down the far shelf, and lastly a meat rig for by the aerator and to my right just in front of a reed bed. 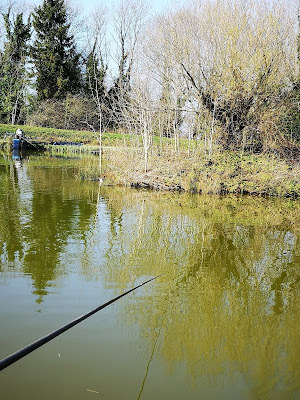 I went across to the far side, and again liners were the only indications, the fish were swimming through without stopping to feed. It was about now that I saw a tail next to my net to the right, so I went in with my shallow rig and I had a 6lb carp, just two feet from my net, I threw a few pellets in and went back across, 15 minutes later after having had a fish from across there was another next to my net, I went in and had that one aswell, but that was to be my last from there, odd fish showed down there during the match but I couldn't tempt another from there, I had odd fish across but it was hard for everyone, even the main lake was being hard, dave.wride to my left was.fishing his normal soft pellet.approach, and his peg for better as the match progressed, he was catching plenty of skimmers, nothing big but plenty of bites, as for the carp side of things , John page seemed.to be doing the best as far as I could see, I was a few.fish behind him , but in the last hour I had a few better fish on meat down to my right by the weedbed, I had though mat was in between us, but I wasn't to sure as there seemed to be a total lack of activity from him. We ended at 4.30 and I don't think anyone's was complaining as it was the coldest I have been in weeks, dave.to my left was.First to weigh , his silvers went 20lb exactly, which was enough to take the silvers money, just edging out Mike nicholls by 4oz, my fish went 52 lb which was good enough for second. The weigh sheet is below as normal, it's fished a lot harder than expected, but we had a lot of cold rain during the night and the cold.wind got a lot stronger during the day , but the main lake was a lot harder with 38lb winning overall. When I went around to clear my.peg out , I stopped for a quick chat with (our) Mark Thomas who I haven't seen for a while, I thought he had sold his match tackle, the only rods he has got now are 5 lead rods, so I told him it pays to fish to your strengths then wandered back to my peg. Back to huntstrete again today for the start of this year's popular matches for the over 55,s and disabled, 12 minutes from my door to the fishery, that makes a change. 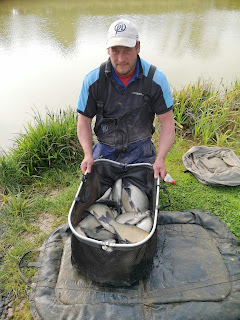 Only 19 fishing today which is a few down but at least it afforded us a bit of extra room, I got quite early into the draw bag and pulled out peg 28, definitely a run to peg, it's got an end of an island to fish to, and the f1,s and carp run around the islands in this lake, it's a long way off 16/17 mtrs, but with no wind today it should be quite easy. 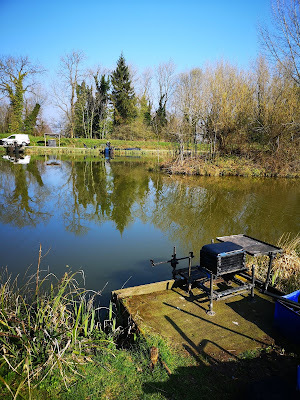 I only set a meat rig rig for 5mtrs, and two pellet rigs for over towards the island, one just off in about 2 foot of water, and the other up on the island shelf in 15 inches of water, the island does have a nice look to it, even if there are a few branches and bits hanging off the it. 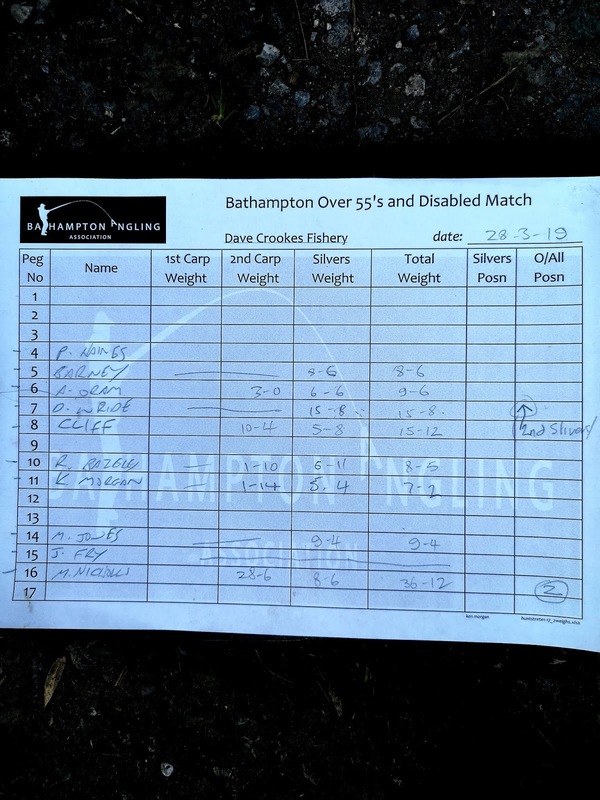 The short meat line was a waste, only.one bream, and only.one fish on the shallower island rig, all my sport was on the slightly deeper rig, I fed 6mm hard pellet via a catapult and fished a banded 8mm on a b960 size 16 on .16 line. And I've had an enjoyable day catching small carp and f1,s, it wasn't hectic, just nice and steady, In the end I thought I had about 90lb, but the scales.told a slightly different story with my nets going just over 103lb .
. 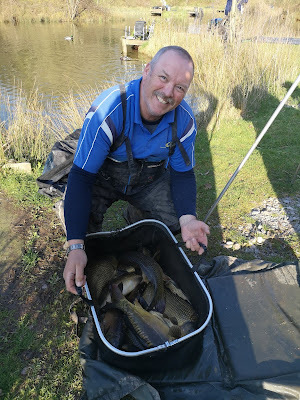 The lake as a whole has fished a bit hard , I don't think the bright sunshine, no ripple and a slight frost helped., Mike nicholls came.second from peg 16 with just short of 37lb. Top silvers.went to hughie(eggo) Evans on peg 31 with 18lb, catching roach and some.skimmers up in the water. 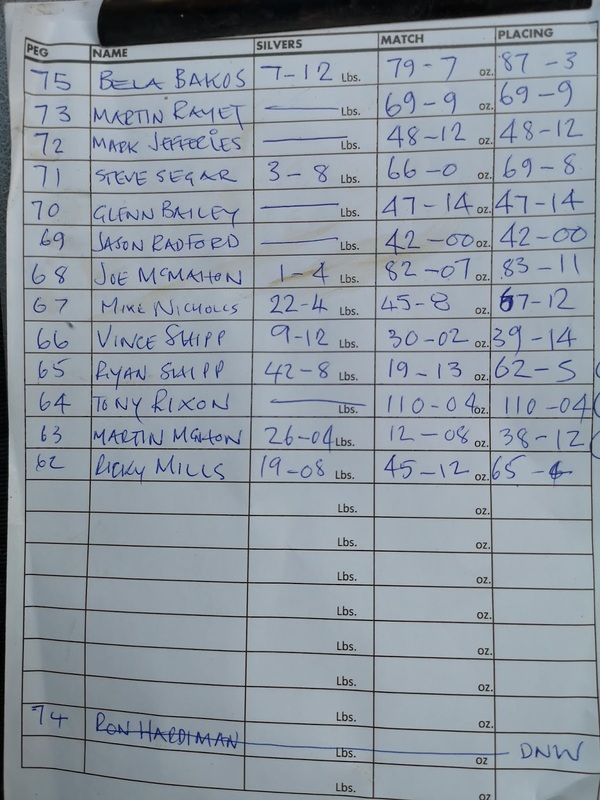 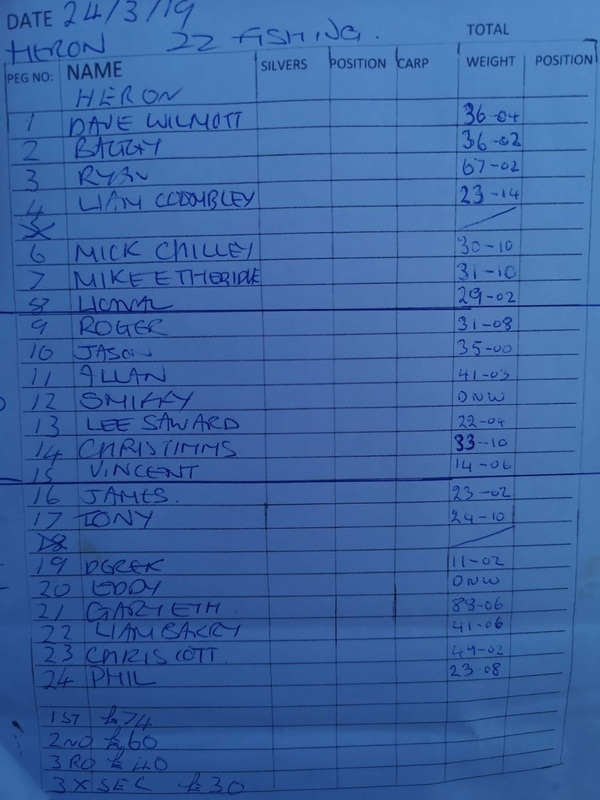 The weigh sheet s are below, and also I am running a match on Shiplate farm next Thursday on West pool, ring or txt me to book in, it will be a 9am draw. 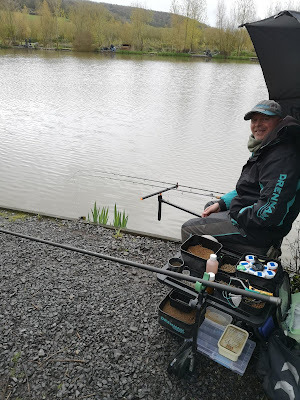 Haven't been to ivy house for a few months, so with nothing else on it was the ideal opportunity, took Jason to buy my breakfast, and very nice too, always tastes better when someone else has to pay for it LOL. 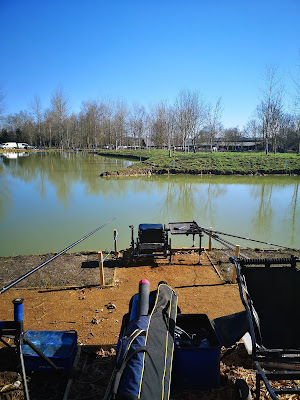 I got into the draw queue early and pulled out 17, not the best of draws by the seem of things but I was told by several people that some of the better carp seem to like this area, but it didn't sound as though there were many f1,s around this end of the island. 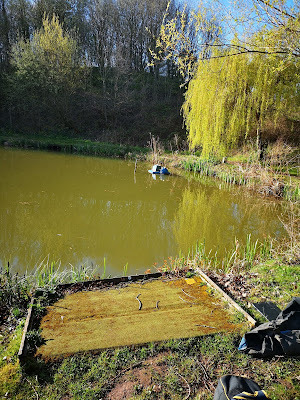 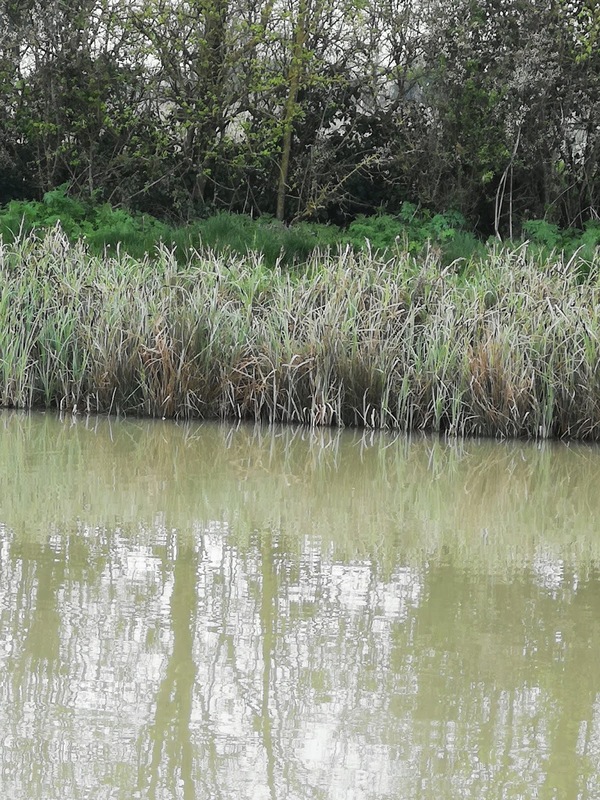 I set up a rig for maggot.over groundbait at 13 mtrs, a method that has been producing on this lake, a pellet rig for 16 mtrs, where I managed to get into the shallower water.towards the island, Andy has a 16mtr limit at the fishery, and there is a ban on long lineing aswell, which was a shame.As I could have easily reached the island with another extension, also a maggot rig for the same.16 mtr line, and a small waggler to fish near the island. 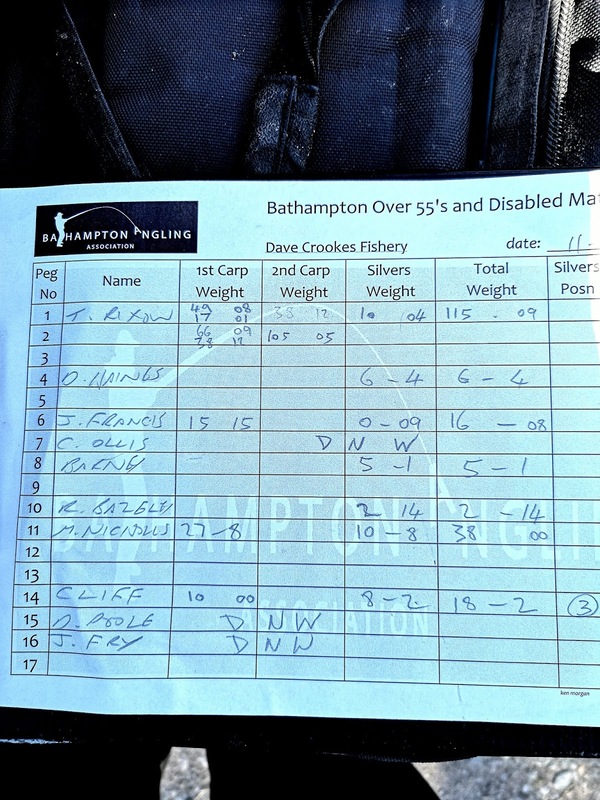 At the start I began on the 13 mtr line with maggot, but after 15 minutes I had only had one fish, so I switched to the banded pellet at 16 mtrs, and began catching small carp straight away, but they were tiny, but feeding hard 4,s and banding a 6 at least I was catching well , but Gary etheridge on 21 was flying , catching f1,s, which were 4 or 5 times bigger than my carp. 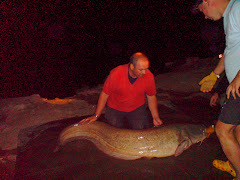 And it never improved for me as the fabled better fish never showed and I never had any f1,s till the last hour when I managed a few on maggot, in hindsight(I hate that word) I should have switched to maggot earlier as I may have had a few more, but I don't think it would have mattered to much as Gary caught to the end, so he was always looking like the winner, and he was as his net of all f1,s went 88, pushing Ryan shipp into second who had 67lb from peg 3. 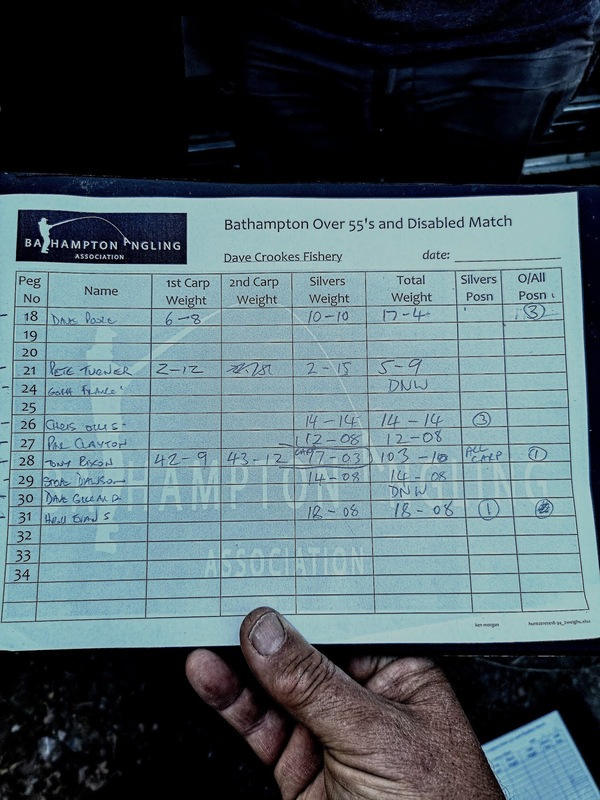 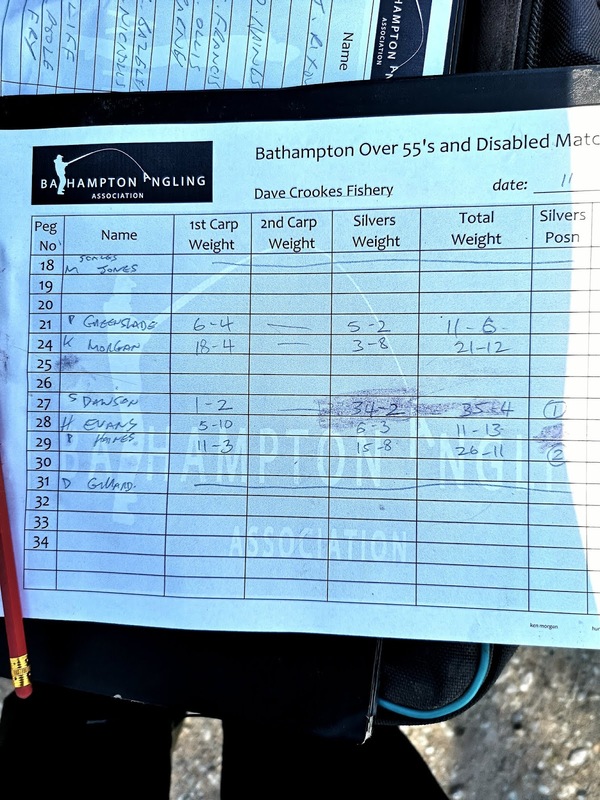 The full weigh sheet is below as normal, shows there were plenty of fish caught , even if most were very small, hopefully they will grow on, quickly I hope.